AquaStretch™ Refresher Course / Skills Check: cost of manual will be deducted from your course fee. A new pool guide will be provided at no charge. Price shown at check out below includes 13% HST. 8-Hour AquaStretch™ Foundations Course includes colour AquaStretch™ Foundations Manual, laminated pool guide, and certificate of completion. This 8 hour course may be taken in 2, or 4, or 8 hour training segments, depending on what is scheduled. HST is included in your check-out price. Contact Connie Jasinskas for discounted payment options using etransfer. It's here - the newest development in AquaStretch™! Self-AquaStretch allows use of this amazing technique in group aqua fitness, personal training, and aquatic rehab. AquaStretch™ Foundations is an 8-hour course introducing 10 AquaStretch™ Procedures. The course includes the AquaStretch™ Foundations Manual and laminated Pool Guide (as seen on the Store page of this website). 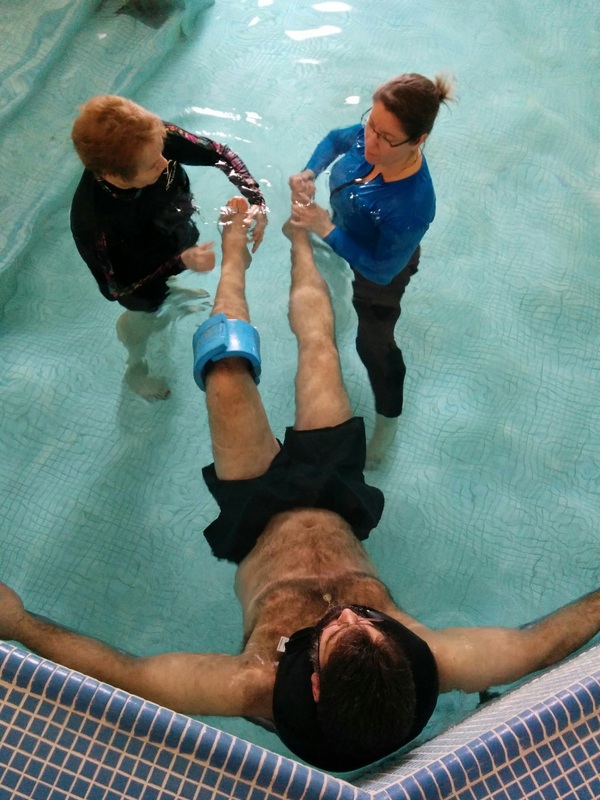 Course participants will learn and practice the unique AquaStrech™ Procedures and Technique in the pool and on land. AquaStretch™ is an excellent modality for Personal Trainers, Massage Therapists, PTs, and PTAs, Kinesiologists, and others who work one-on-one with people in the water or on land. See testimonials on this page from participants in AquaStretch™ training. Trained Facilitators need to Practice! AquaStretch™ is a manual skill. We all get better with practice and a variety of application opportunities. Get in touch regarding Mentorship, Refresher Courses and Skills Checks. See below if you want AquaStretch™ training for yourself or your facility staff. Fill out an AquaStretch™ Hosting Inquiry Form. AquaStretch™ changed my life when Connie gave me a treatment last year at IAFC - It's a course you will love...It will grow you personally as well as professionally, and I can't say enough good things about Connie & Laurie - they're great educators! "Connie Jasinskas was an excellent, totally perfect instructor for the way I learn best. She teaches in a style that is easily and thoroughly understandable. She values and encourages students' opinions and questions, which in turn, adds to making the class better. Connie's pool demonstrations are clearly patiently presented step-by-step. This helped stop the possibility of getting overwhelmed by all the information being presented. This also allows the students to feel confident that they can (or will eventually) become good AquaStretch facilitators. She creates the optimal environment for learning. She doesn't talk down to you or judge you. Students value her experience and knowledge. She is a wonderful person." "The AquaStretch Specialty Certificate was what I expected - plus much much more!! It was so beneficial to have so much pool time and be able to practice. Being able to practice on the instructors was even better because we got very constructive feedback. Connie is a fabulous instructor. She explains things in "layman" terms so that us non PTs can understand. I totally understand "intuitive movement" so much better!! She used the analogy of how we stretch in the morning and how we move our bodies to stretch and "wake up". Bingo! I finally got it!! I thoroughly enjoyed myself and learned SO SO much. It was worth every $!" I have tried the toe grip on a participant who need some extra care and said she did feel better. Plus I worked on another participant twice in a week and she felt really good immediately after, both people would like to do more. I felt good with the feedback, you have taught me extremely well. I am also excited about doing more of this work. I truly enjoyed the AquaStretch™ Course on March 3, 2013. Are you interested in hosting an AquaStretch™ course for your staff or facility? To arrange an AquaStretch™ Foundations Course, two day Certificate Course, skills checks or advanced training for trained AquaStretch™ Facilitators, fill out a hosting inquiry form below.